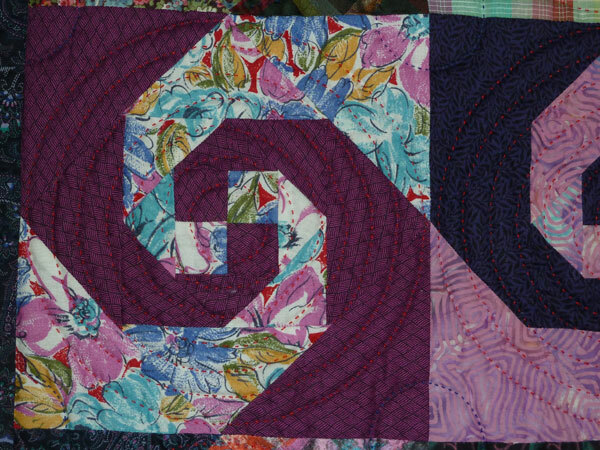 Caroline chose to talk about her ‘Country Dancing’ quilt, which was her first Art Quilt and was a cover quilt for The Quilter magazine in 1994. 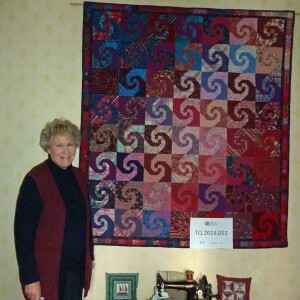 She talks about the importance of colour and fabric, as well as simplicity in quilt design. Caroline’s quiltmaking started while living in America and, on returning to the UK in the early 1980s, joined the quilting revival taking place at the time, later discovering a historic family link to quilting in her Aunt’s attic. Throughout the interview Caroline discusses how colour and fabrics inspire her work. She also discusses her involvement in the organisation Fine Cell Work, teaching prisoners how to quilt. Khurshid Bamboat [KB]: Today is Wednesday 14th of January 2015, Khurshid Bamboat interviewing Caroline Wilkinson in Dulwich. Her ID number is TQ.2014.053. Morning Caroline. Caroline Wilkinson [CW]: Hello Khurshid. KB: And so nice to be able to talk to you about your lovely work and your involvement with quiltmaking. You’ve shown me your quilt that you have great affection for. Can you tell me first of all the name of the quilt please? CW: Yes the quilt is called ‘Country Dancing’ and it’s called that as you will perhaps have noticed that there’s quite a lot of movement based in the quilt because it is actually a traditional block known as Monkey’s Wrench but the way that I have chosen the colours and the designs means that I have in fact chosen quite a lot of checked fabrics and the way that the colours are placed in the quilt just suggest a line of country dancing. I think if you look at it carefully you will see what I mean. So the fabrics that are chosen in the quilt are very dear to me. They are a lot of Liberty fabrics which my Mother encouraged me always to use because that’s what she loved and some of her, she was a dressmaker, she loved to make her own clothes, so I have scraps of fabrics that have been left by her, um and the checked fabrics were particularly chosen because I wanted this feeling of country dancing, this movement that this particular design gives you. KB: Can you describe the quilt for us? I know you’ve already described it but do you know the size of it? CW: Yes I do [chuckles] because it was actually chosen as the front cover of The Quilter in Autumn 1994 and it is actually 58 inches by 67 inches. KB: Thank you Caroline [laughter]. CW: And the reason really why I’ve chosen it is because I had first started quiltmaking in the States in 1981 and this is, as you can see, made in 1993, quite a few years later and in a sense it was my first sort of foray into trying to make something which although was based on a traditional block actually was slightly made, not for a bed, it was made for a wall and it is made to hang on the wall and so you could say it was my first attempt in trying to do some Art Quilting. KB: Is it your first wall quilt then? First wall hanging? CW: No it’s not my first wall hanging, um, but it was certainly I had given up the idea that I wanted to make quilts for beds, I’ve been there and done that, um, but it was my first, my feeling was that I wanted this quilt to go on the wall, because, because of the fabrics in it. KB: Is it always hangs there or do you sort of..? CW: No, I change it um I have a number of what I call my wall quilts which I alternate. KB: The colours, I mean, I know how good you are with colours but when I saw it, it’s essentially sort of in reds and blues, am I right? CW: Yes and um dark reds and blues and of course there are quite a lot of light colours to show off the, um, block design. So it’s got purples in it and they’re all printed fabrics, so yes it’s got a mixture of colours actually but the overall impression is that it’s a red, blue, purpley number. 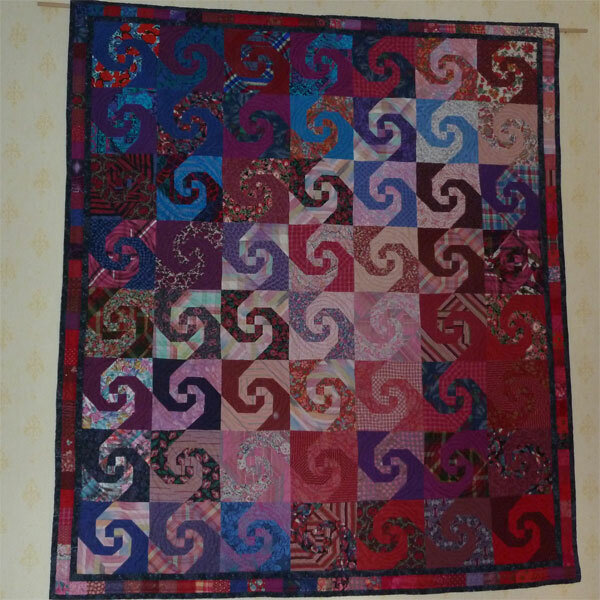 KB: Is it hand quilted, hand sewn, hand pieced? CW: It is hand quilted. It’s not hand pieced no it is machine pieced but it is all hand quilted and that, the quilting was quite simple because I suppose what I love about quilts, I like the simple design something that is actually quite, um, straightforward that allows the fabrics to speak and the quilting again is something that is not the part that I enjoy most about making quilts, so the hand quilting was actually done on the frame, I have a large frame and um I used a slightly thicker quilting thread because I wanted to get the sort of feeling of country dancing that sort of, can’t think of the right word, but I wanted the quilting to show up; it’s circular so it’s also to provide movement to the quilt. CW: Yes and also I suppose because I was actually thrilled that I managed to have it accepted at one of The Quilters’ Guild’s National Exhibitions which was entitled A New Look at Old Traditions which was held in the City Art Gallery in Edinburgh in 1993 and so that for me because I didn’t have a great deal of time to make quilts because I was teaching full time, um, and a lot of inspiration came from actually having a competition to work for. So to actually get the quilt accepted for that particular exhibition was just a great boost to one’s confidence. I’m sure you can appreciate that. KB: Yes I can. So when did you first start making quilts Caroline? KB: Wasn’t it at Seven Dials? CW: Perhaps it was the second one! We’ll have to look that up. In 1981… you’ll have to stop it [recording is paused]. KB: Sorry Caroline yes you were saying about your first quilt that was accepted in The Quilters’ Guild and when was it? CW: In 1983 and it was held at the Guildhall Art Gallery in London and it does seem a long time ago when I look at the quilt that I made for that exhibition and the quilts that were accepted you realise how far people have gone with their quiltmaking. KB: For sure. Do you have any preferred styles or techniques that you perhaps always use in your quilts? 0:09:39 CW: Yes, I am a piecer rather than somebody who makes appliqué or pictorial quilts. I love geometric quilts. I love the simplicity of some of the geometric designs um so I am really interested in those just trying to twist the technique and make a slightly different piece. I’m not very good on embellishing my quilts or using any particular… I dye my own fabrics but I’m not very good at using what I would call Surface Design. I actually prefer the fabrics, as I’ve said before, to speak for themselves and it is the fabrics that for me makes the quilt. KB: Do you normally draft out your designs before you start, even if it is on a piece of paper or an envelope like some people do? CW: No I’m not one of those people at all. I work very much intuitively. I do have a design wall, so called, which is a flannelette sheet hung up again in my, so called, studio which I would never allow anybody to go up there because it’s such a mess and I’m a very messy person I suppose the way I work. I always remember being told as a child when I was in Africa – I was born and brought up in Africa and I think just going back to colours that I am influenced by colours from my childhood but I always remember in painting lessons the art teacher telling me that I was a very messy person and I think that continues with my quiltmaking. KB: I don’t believe it for a minute Caroline. I have seen your quilts and your house and neither of them are messy. So what do you enjoy about quilt making? I know you are a piecer but is there anything that you don’t enjoy, in any aspect of quilt making that you don’t really enjoy? CW: Well the most difficult part of the quiltmaking for me is always deciding on the quilting. I actually like playing with colours and piecing the quilt. I can spend hours and waste hours some people might think just playing around and sticking bits of fabric on the wall and taking them down again and literally spend a long, long time deciding on the placement of my colours my pieces so the actual quilting for me is the part I am least good at and nowadays I machine quilt partly because of time. I think that’s really the reason. KB: This question says ‘what technology do you use when quiltmaking?’ It’s a question I find quite difficult to ask because I don’t think you use any technology except for yourself. KB: I know lots of people use quilt programmes and a computer, but I don’t think that is part of your quiltmaking at all. CW: No, no the only thing I do on the computer is I actually look at other people’s quilts. I can actually spend quite a lot of time researching other notable art quilters. It’s amazing what you can find on the computer and also I like looking at other artists’ work not quilt artists but just artists in general and looking at their colours and the way that they design. KB: Is there any particular artist that you are really fond of, that you keep going back to? CW: Yes there is a woman and I’m just trying to think of. Her first name is Monroe. I think its Monroe Hodder, she’s an American artist. I’ll have to check her name and I’ve loved her work and of course I love Paul Klee, but Monroe is a contemporary artist. Now you’ve caught me on the hop. There are many artists whose work I enjoy. KB: Where and when do you quilt? Is it anytime or a specific time that you try and put aside to your quilting, when you can get to your quilt? CW: Well I have to quilt now I’m getting on I have to quilt in the daytime. I have to work in the daytime. I would work in the daytime anyway as far as colours are concerned but I used to machine piece late into the hours of the night to get some work done. I cannot do that anymore. So I can get up early and do it but I tend to work during the day. KB: And do you usually work upstairs in your bedroom that you call the studio or down here in the kitchen or it depends what you are doing? CW: No I always work upstairs now. Fortunately I have that room free now it’s been that the children have disappeared from home. How lucky is that? KB: And how do you go about making a quilt? I know the fabrics are the main feature of your quilts as it would be for any quilt maker but do you lay your fabrics out and decide what colours you are going to use and how you are going to get, for example, your value and your contrast? KB: Are there any colours that you don’t like? I mean everybody has likes but sometimes people, I know someone who won’t put brown in their quilts. CW: No, there are no colours that I won’t like there are some colours that I obviously find more difficult to use. KB: Now in your quilt that you recently put in Dulwich Quilters last year’s exhibition, A Trip down Memory Lane, you had virtually every colour I think. CW: Under the sun. Well yes that was something I don’t normally do. It was a scrap quilt, completely a scrap quilt and it was a quilt made for a bed so how unlike me was that? But the reason why I made it is because like many quilters who have been quilting for a long time have got masses of scraps left over and quite a lot of Liberty pieces which I wanted to use, again because they had been given to me by my mother. So yes I just absolutely decided I’d go for it and I’d chosen the design which was a block which was very easy to piece and when you sewed it to the next block it didn’t have any seams that you could match, had to match so I thought how good is that. So that particular piece was made on a really crummy old machine which belonged to my daughter and I made it while I was, I’m a Granny now and that’s lovely, and I look after my grandchildren two or three days of the week, so when I’m in New Malden I made this I made the blocks up for this quilt. KB: How much time do you spend on quiltmaking? CW: Not as much as I’d like. KB: Do you try and do it every day? CW: Oh no nothing like that. I tend to be motivated now. Um. by making something. I’d like to make a quilt every year and I’d like to now try to make what I call a really Contemporary piece that might have elements of tradition in it. Um. but I’d like to have that finished so possibly two or three quilts a year in that style. KB: What do you spend money on for your quilting? Is it just on the basics because I don’t think you are the type who spends a lot on fabrics; you like having your little bits and pieces. CW: Well absolutely yes [laughs] I have never [laughs] my father was a Scottish gentleman and I was taught to be careful about [laughs again] spending money, so I have never spent huge amounts of money on buying huge amounts of fabric I just I suppose actually I have spent huge amounts of money on buying lots of little pieces, but now I don’t buy very much fabric at all because I’ve got a lot to use up and I challenge myself to use what I’ve got so I very seldom buy any fabric I do buy threads of one sort or another but again not very much. 0:20:39 KB: Any particular favourite thread or wadding that you like using? 0:20:44 CW: Well as far as the threads are concerned, um, there are particular ones I like, um, Wonder…? CW: Tut thread [laughs] You are so knowledgeable Khurshid you can prompt me, um, and then of course I use some cotton perle threads as well. Um As far as the wadding is concerned I tend to use a very thin one which is known as Thermore or I use 100% cotton. KB: What did you use in your Trip down Memory Lane just for interest? CW: That was a 100% polyester actually which was a very good quality one. Um, I can’t actually remember its name but I wanted a bit more loft in that so that’s why I chose that particular one. KB: So when you look at other people’s quilts, what do you look for or notice? CW: Well, I always notice colours and obviously I notice design, but looking what makes a good quilt is a very difficult question to answer because what one person likes another person doesn’t. So I think I look for something that gives me a very good visual impact and, um, I also actually look at technique as well. I don’t really like a shoddy making, shoddy looking number so, you know, I am very admiring of people who can do wonderful things particularly with their quilting and their machine quilting although that’s not a route I would go down. I tend to like quite simple machine quilting but I’m very admiring of other people’s quilting and also their hand quilting and their embellishments and all the other things and printing and etc which I haven’t seem to have got round to doing. KB: What do you think makes a good quilt? What would be your definition of a good quilt? I know colour. Design? CW: Oh design has to go hand in hand with colour. Um. It’s difficult for me to think because when I see it, I say ‘oh that looks terrific, that’s fantastic’ and then actually to remember which one and why you like it. I mean you have to really think about it. Umm. But it has to be something which is… the feeling that it hasn’t been totally machine made. There are some quilts which are what I call rather clinical and I like that hand look, um, that many quilts have despite that they may have been machine pieced and machine quilted and I love the sort of rusticy look to a quilt. I can’t quite articulate what I’m saying, almost a sort of primitive look um which can be a very sophisticated but at the same time it doesn’t appear to be. KB: So did you like the Gee’s Bend quilt which were…? CW: I loved the Gee’s Bends quilts, yes. KB: That would be your sort of type of quilt because of the colour and the vibrancy. KB: Made movement even though they are very simple. CW: Yes and there was a wonderful exhibition of the Japanese Boro quilts which really spoke to me because again there was a simplicity about them and the colours were amazing and actually they were well made at the same time. KB: So where do you get your ideas and inspiration from Caroline? CW: From many, many sources [laughs]. From the natural world from um other people’s quilts, from postcards. I’m a huge collector of art postcards and art cards in general, um looking at artists’ work. Yes, it’s endless the list, absolutely endless. KB: I know you don’t like machine quilting because you find it clinical and you only use it out of necessity but what do you feel about the sort of difference between hand and machine quilting in a quilt for example? I mean they both are have great reasons to use, but do you think people are forgetting to use hand quilting because to machine it is so much easier? CW: It’s difficult to know why quite people machine quilt much more readily now I think it’s something to do actually with the sophistication of the machines, um, because actually the technology that you can use with some of these really smart machines. I’m not saying that people don’t have to know how to use them and I am not putting them down from that but I think the opportunity now would be from really fantastic machines means that people have the chance to experiment with their work in a way that, you know, wasn’t available in the past. KB: How many quilts have you made since 1981 Caroline? CW: I’ve no idea [laughs]. CW: I don’t think it is in the hundreds, no. I don’t think it is. KB: What do you now with the quilts that say you are making in the last 10 or 15 years? Are they given to family or…? CW: I have done that, yes. And I’ve sold a few um so yes. I’ve got, I’ve inherited an old wooden chest from my mother and I’ve got quite a number of quilts in there. KB: You collect quilts don’t you? CW: I have collected some quilts, some old antique quilts in the past. I’m not doing quite as much of that now. Um yes I have just always loved fabric. I think that has come down the generation and interestingly enough I thought to myself ‘do I have any quiltmakers in the family?’ and the immediate answer was ‘no’ and then of course one of my mother’s sisters, my aunt, a much older sister of my mother, my Auntie Margaret, she had a house and in that house was a regiment of aunts that lived there with her. So she had fabrics and I discovered a couple of old quilts right at the top in the attic, so somebody must have made them. One of those many aunts that had lived in that house. KB: But not anyone that you knew yourself? CW: No, nobody I knew myself. CW: Apart from the fact of course I knew my Auntie Margaret and I was clearing out her house and I discovered these pieces so wasn’t able to ask her who made them. KB: Did you learn sewing from your mum or aunties or at school or a mixture of everything? CW: I learned sewing really from my mother yes. We did a bit of needlework at school but I was encouraged to do Latin instead unfortunately. It was deemed to be more useful so I did very little sewing at school. KB: And what is the biggest challenge you face as a quilter today in 2015? CW: Just to keep going really [laughs]. Yes, it’s interesting I would not want to not quilt but sometimes I have quite low periods of thinking ‘what am I going to be doing next?’ And then of course you get inspiration from going to an exhibition or meeting up with my quilt friends always very important to me, um, who encourage me along life’s way yes just really to keep going. But I am also involved with Fine Cell Work. KB: I was just going to ask you about that. I know you’ve been part of Fine Cell for 15 years now? CW: Yes, about that length of time which is actually a tremendous privilege and I am teaching quiltmaking to men in a London prison. KB: How did this all evolve? How did you get into teaching at the prison? CW: Well when I left my school teaching and I retired early from that I did some Adult Education, um, and I happened to see an advert in our local Diocesan paper asking for teachers of needlepoint and canvas work to teach in prison. And for some reason or the other I’d always wanted to work with women in prison. So, um, I applied to Fine Cell Work as it was then and said I don’t do needlepoint or canvas work or embroidery much but I do teach quiltmaking and I think the Chief Executive didn’t exactly know what a quilt was actually but she was prepared to take me on and so I started to teach in Holloway, a woman’s prison in London, but very sadly that didn’t work out for all sorts of reasons and um so for me actually it was better I moved to a prison in South London because that’s where I live and I’ve had the privilege of going in and teaching these guys to make quilts, um, in two prisons actually in London. And it’s been extraordinarily satisfying because it gives you an opportunity to not only just teach your craft, which I love very much, but also to give the men hopefully a new perspective on life and the fact that they actually can contribute and really make something of their lives even when they come out of prison and we’ve been incredibly fortunate with the support that Fine Cell Work has had and I’m sure everybody will have known about the big exhibition of quiltmaking in March 2010 at the Victoria & Albert Museum where we made a quilt for that exhibition. 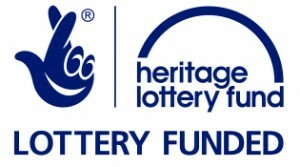 And more recently have been involved in making a quilt for Tracy Chevalier, The Sleep Quilt. And, um, even more thrilling perhaps, not even more thrilling, but we are just about to put on an exhibition of quilts, quilts which is entitled ‘Voices from the Inside’ at the Quilt Museum and Gallery, um. So that’s going to open on January 23rd of this year and run through to May. So this is a wonderful opportunity to show the kinds of quilts that we’ve been making, which I hope people will feel will meet the standard of other quiltmakers. KB: I’m sure they will because I’ve seen some of the quilts that your men have made and they’re just lovely, they really are. And I’m sure that they are very, very appreciative of all the work and care and encouragement, mainly, that you’ve given them, um, and I think it must be awful for these men to be locked up in small little rooms day after day and this must be like a little bright light in their lives. So why is quiltmaking so important in your life? Is it to give [CW: Well I…] other people the benefit of your experience to encourage people? CW: Yes, yes very much so, um, it’s something that I’ve been able to use to help other people and I suppose from my own perspective [beeping in background] it was something that I’ve always wanted to be good at something and, um, and I’ve actually felt that I have managed to achieve something with my quiltmaking, so from that point of view that’s been very good. 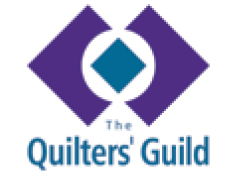 KB: And where do you think quiltmaking is going in the future? Do you think that young people will be encouraged will sort of carry it on? I know that quiltmaking has been going for years and sometimes we have a sort of lull and sometimes like in the 70s, late 70s because of the bicentennial, American bicentennial, the quilts suddenly became popular again. CW: Yes I think it was the resurgence of quiltmaking which came from the Whitney Art Gallery exhibition in the States which made people look at quilts in a completely different way. No I think quiltmaking has a hugely exciting future and all sorts of wonderful things that people are doing with quilts now and using all sorts of amazing techniques and, um, and using surface design on quilts I’m sure that quiltmaking is going to go on and have a very bright future and it’s really interesting to see how quiltmaking has taken off in this country and also in Europe as well, as well as the States that we always think is the home of quiltmaking. So, yes, it’s interesting that from the exhibition at the V&A how that actually reached out to quite a number of younger people and, um, I was encouraged to see that there are, particularly perhaps in these recessional times, people taking up crafts such as quilting and knitting and stitching in general so, yes, it’s we quilt makers now can come out of the closet and admit we are cutting up bits of fabric because the younger generation are doing that as well too. KB: Will you be teaching your granddaughters how to quilt? CW: Oh absolutely whether they like it or not [laughter]. KB: And you know that lots of people make this noise about quilters and embroiderers never are perceived as artists in their own right like you know artists who paint. [CW: Um, absolutely.] Because it’s very rare that a quilt or a [clock chime starts] small quilted art hanging [CW: Mmm] is accepted in a gallery for instance. KB: Do you have any thoughts about that? CW: Well I think it is a shame. I think it’s partly that stitching has always been seen as something that women do and, [clock chime ends] um, I think perhaps the art world is often being dominated by men well you think of women artists actually having to strike out on their own so it’s not surprising in a way that stitching hasn’t been recognised as an art form. I think things will change; I hope things will change. It’s possibly that fabrics also have a life expectancy so that may be another reason why people don’t really regard quilts as something that you know they want to purchase and buy and put on their walls because at the end of the day the fabrics might fade or whatever. Um, it’s hard to know what keeps people with that view but I’m sure things will change. KB: Is there anything else you would like to comment about; your own feelings or any negative feelings about quilting or quilt making, quilters? CW: No I just feel I’ve been very fortunate to find a craft that I, art craft that I can… work in and, um, it’s been so satisfying for me. I just think that’s been brilliant. I can’t paint and I can’t draw and I can’t do lots of other things like photography and, um, so sewing has been greatly emotionally satisfying. KB: And through that of course you met a lot of people who are now your friends. KB: You used to belong to a couple of groups. CW: Yes, yes that’s been a marvellous benefit of quiltmaking, um. I’ve been able to visit other countries and so on and get to know other quilters all over the world. How brilliant is that [laughs]? KB: Well thank you Caroline for sharing your stories with the Talking Quilts project and look forward to seeing many more of your lovely quilts.